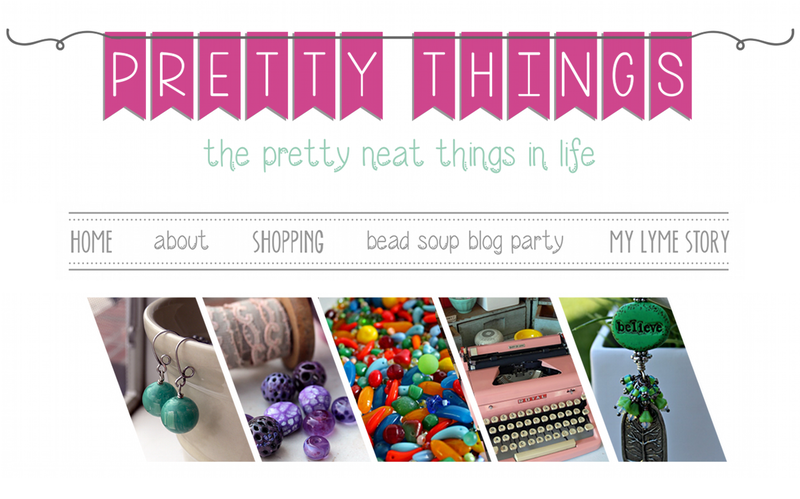 Pretty Things: Welcome to the 7th Bead Soup Blog Party ® 3rd and Final Reveal! 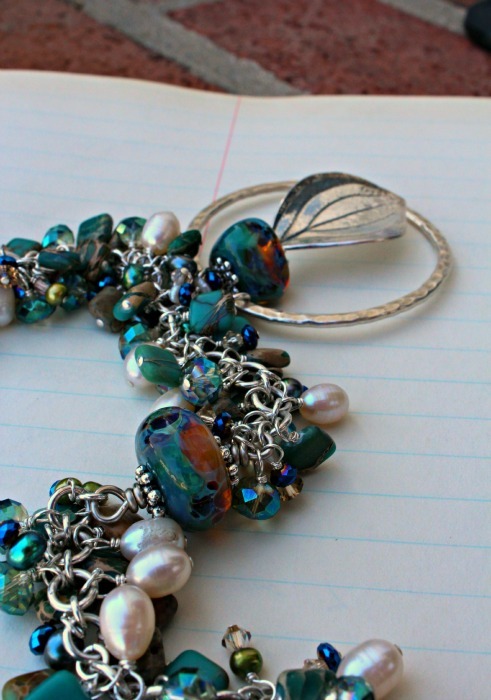 Welcome to the 7th Bead Soup Blog Party ® 3rd and Final Reveal! 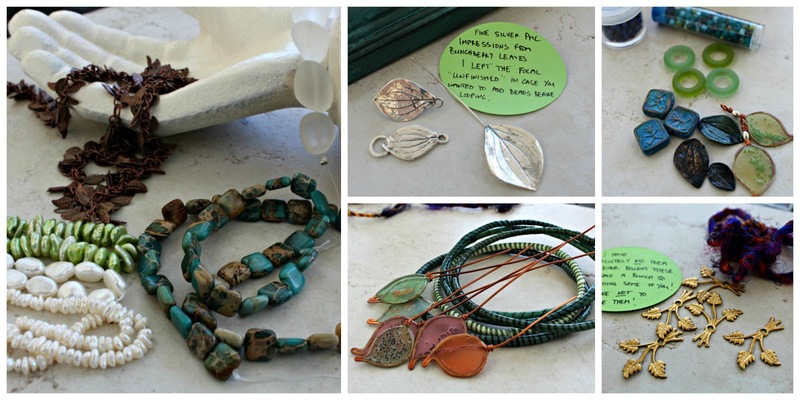 The 3rd and final reveal for the 7th Bead Soup Blog Party® has arrived! First, I'd like to thank everyone for putting up with not one but two postponements of reveal dates. In this post, I explained the health issues I've been dealing with for what seems like forever -- and it's because of those health issues that I am SO VERY EXCITED about my reveal today!!!! Not only did I make all of my pieces yesterday, but I made them with swollen hands and arms that felt like they'd been hauling lumber for a living. I was seriously worried that I wouldn't be able to make a thing today, let alone more than one thing, but I truly think my partner will be pleased (I sure am!). My partner for the third reveal is the ultra-talented Barbara Fernald. She made the leaf focal and clasp, the leaf head pins, and the square beads in my soup. WOAH Nelly but the woman has skills. As a reminder, these are the beads and components Barb sent me (click for a larger view). I'm going to show you my favorite piece last, so hang with me for a few, m'k? Ready? Let's go! 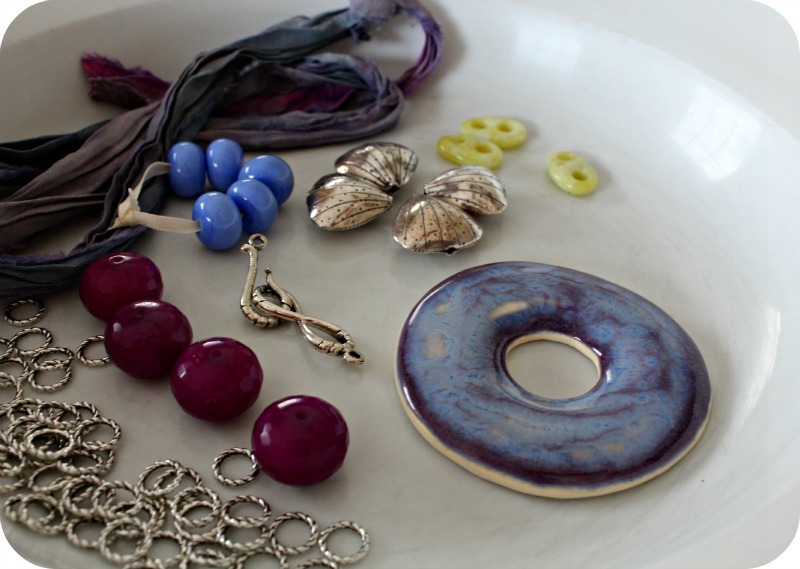 For these, I made the purple and green enameled beads some time ago and finally got to use them! I didn't have any copper ear wires, so I made them. A quick trick, especially if you are in a hurry and don't have time to file the rough ends off the wire edges? Snip the ends off head pins and make a small loop with that end. The end that goes through your ear will already be nicely finished by the manufacturer! To make your ear wires exactly the same size, make the large curve over a mandrel BOTH at the same time. I cut two equal-sized pieces from the bangles and ran wire through them (they're conveniently hollow). What else did I use from Barb's soup? 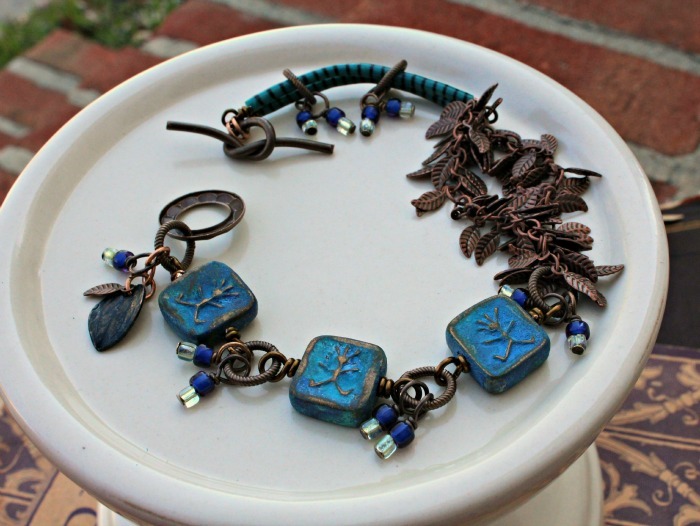 A double length of copper fringe chain, her amazing handmade patinaed beads, blue seed beads, and her handmade leaf charm. 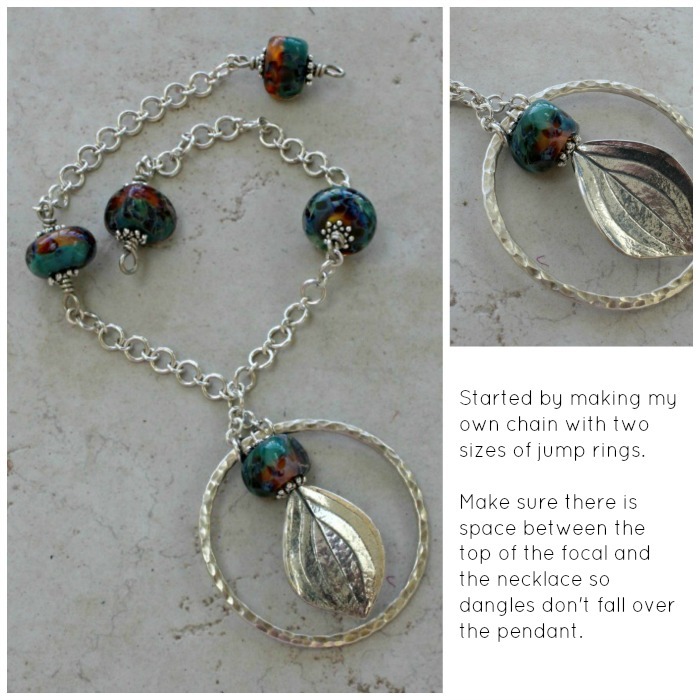 At first, I used just one length of tubing, but to keep visual balance and proper weight distribution, I doubled up and connected them with two textured jump rings with charms. I love things that allow me to fidget, and the fringy chain just begged for more movement along the rest of the bracelet. This is SO unlike my normal style -- I'm tickled that I even thought of it! And now the piece that has me so proud I could just burst. While it's in my favorite style (lots of dangles), it still was quite a challenge because for weeks, I haven't been able to hold my jewelry tools, let alone use them. You can BET this piece is going into my personal jewelry box! First, I had to make a chain, as the only chain I had was too delicate. I took apart a byzantine chain maille bracelet I'd made a long time ago and made a simple sterling silver chain. I added handmade lampwork beads by Jackson River Glass in between the lengths, and since it's "go big or go home", I wrapped the end of Barb's leaf head pin focal onto a large sterling ring from Bead Goes On. Then came a blissful four hours of wire wrapping. I say blissful because even though my hands felt like they were on fire, I knew exactly what I wanted to make and for once, it was all coming together. From Barb's soup, I used all the variscite and the two styles of white pearls. I added some glimmer with light green Czech glass, tiny but vibrant blue Czech glass, and taupe Swarovski crystals. I ended it all with the handmade clasp Barb made for me. My method to this madness is to work with one bead style at a time. First, I added all the variscite. Then I started spacing out the rest of the beads, largest to smallest, slowly tapering the fullness. Periodically, I'd hold it up and see where there holes to be filled or colors that needed to be brightened. See all those tiny wrapped loops? The clasp is worn to the back, but I'm showing it to you like this so you can see the tiny bead details and Barb's exceptional PMC work. I think details make all the difference in the world, and if I wear my hair up, you'll see just a hint of color. 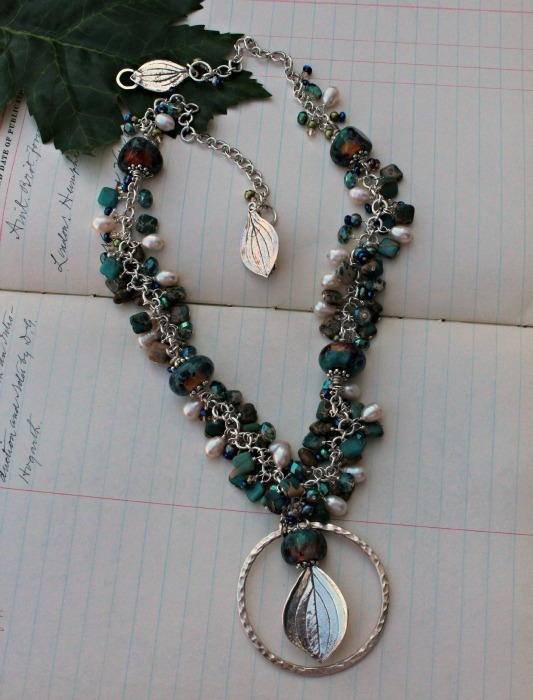 So there you have it -- my creations and the end of this year's Bead Soup Blog Party®! I hope you had a wonderful time, whether participating or viewing. The next BSBP will be around the same time next year, but you don't have to wait until then to have beading fun! You can follow my blog by clicking the button to the right, and please join me and over 1,600 jewelry designers and bead makers at the Bead Soup Cafe on Facebook. 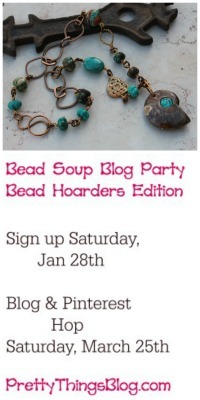 I'll also be announcing the details of my next blog hop, Bead Hoarders, July 20th, very soon! Lori, thanks again for hosting this wonderful event. Your creations are so beautiful. I LOVE the necklace with the gazillion wire wraps. It is soooo worth the effort!! Fantastic, I love that last necklace too although all of your pieces are great. The number of dangles youmade for it is incredible. I'm so glad that you were able to do so much:) Congratulations! OMG! You just blew me away! My hands hurt just thinking about all the wire wrapping you did on that necklace. It's gorgeous! 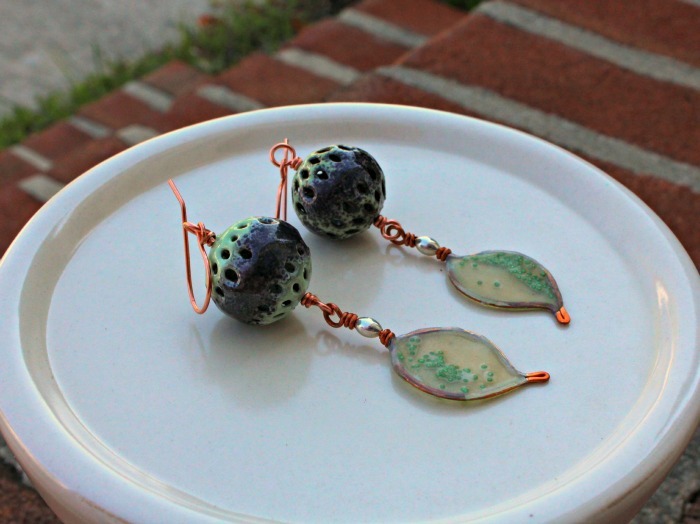 I love how the earrings came out with the polymer leaves. 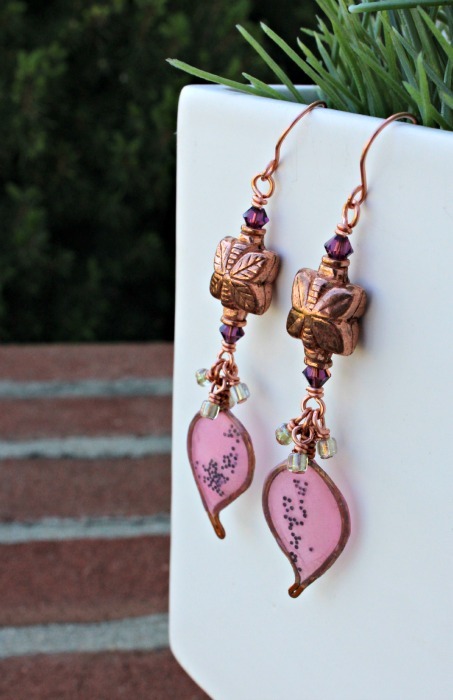 The pink ones with the little green dangles work especially well, and I love the way you made the green leaves a long dangle from the enameled beads. The bracelet brought tears to my eyes. It's just so darn joyful. Those little "tumbling men" on the square beads were some of my first bronze clay beads. Renewed with patina, but i just couldn't figure out a way to use them. I'm so glad you did. I love everything about the bracelet. Thanks so much for such a great experience! 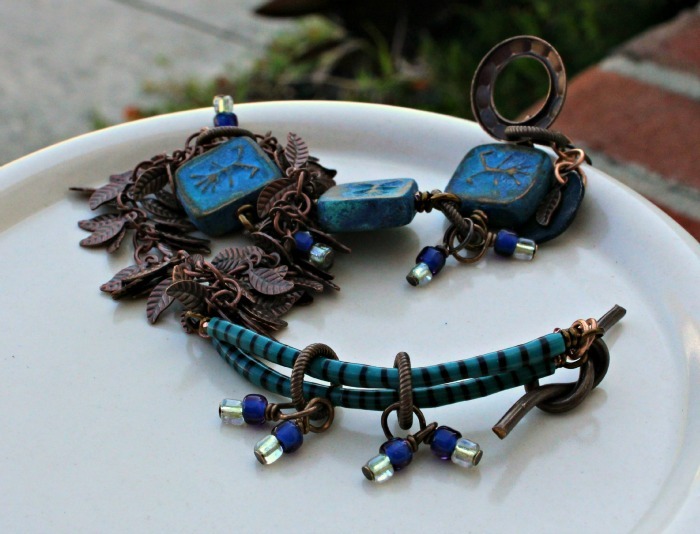 Absolutely gorgeous pieces Lori! Especially the last one. It's truly a labor of love and one that should be worn proudly! Absolutely gorgeous pieces Lori! Especially the last one. It is truly a labor of love and one that should be worn proudly! I'm thrilled you were ABLE to spend 4 hours wire wrapping and the result is absolutely stunning! I love the earrings too and the headpins are so amazing! Thanks for being a great hostess, Lori, and take care of yourself! Beautiful work--as always! I'm incredibly impressed that you worked so hard to make the last necklace while in pain. The pay off was huge because it is really beautiful. Oh WOW! And you did all these within a day? The necklace is so luxuriant! Beautiful design and again, the details are your signature. The earrings are cute and the bracelet is cool. Thank you for hosting the wonderful party. You are the STAR! Lori you are amazing, you create such stunning pieces and all of that wire wrapping WOW Gorgeous!!!!! Lori,Thank you for hosting this wonderfully amazing event. I am so glad that you were able finish your pieces! They are just amazing, I cant believe you wrapped all of those dangles. That is just an amazing necklace. Happy Beading & Hopping! OMG!!!! You did all that wire wrapping in only 4 hours in as much pain as you must have been. I can only marvel at your perservance. You did an absolutley incrediable job!!! 4 hours of wire wrapping - Wow! Beautiful work as always Lori. I am amazed at the number of wire wraps you did but I guess the inner satisfaction is the key :) Thanks a ton for hosting this party despite the hardship you are going through. Can't wait for the next one. Take care and lots of love. wow, you made all these yeasterday and with hand problems? you are awesome! I love the earrings and the bracelet, that copper leaf are special! Wow, that necklace is a show-stopper. I can't believe you put it all together (including the chain!) in just one day. Bravo, my hat is off to you! Lori, your pieces are just gorgeous!!! Can't imagine to do all those wirework with hands in pain ... you're terrific!!! Thank you again for organizing this great event and can't wait for the next party. AWESOME! Don't you love it when you initial thought/plan really comes together for the beads!? I cringe at the thought of wire wrapping all of those beads, but I can see how you feel- totally worth it in the end, cuz it's amazing! My favorite is the bracelet, I love the idea of those recycled flip flop bangles! How did you know they were hollow? did you take a risk and just cut one to see? great work as always Lori!! Enjoy the hop! Love those earrings! Your style is amazing and so are you. Thank you for a fun event. Everything is so beautiful, I love them all! Thanks for hosting this wonderful event!! You have made some beautiful things Lori. I came across your blog party for the first time this year as two members from my forum joined up. Today is their reveal day too. Thank you so much for this. I have spent many happy hours so far, skipping randomly from blog to blog and admiring all the fabulous work on display. I do hope you will be hosting another bead soup party next year as I am very keen to join in. So beautiful Lori! I see you had no trouble whipping together that gorgeous mix. I can see why your hands would hurt after all of those little wire wrap pieces. All the pieces are stunning. Thanks Lori for hosting another awesome hop! Each piece is beautiful. What a great job on the last piece with all those dangles. Thanks for hosting this event. Fantastic work - with the beads and with the blog party. You did it again! Kudos! WOW! Lori you rocked this challenge, Your designs are amazing. Even with your pain you continue to inspire us all. I was worried that these challenges were getting to be too much for you but, you are already planning another challenge for us. Thanx so much for being who you are. Oh what beautiful pieces, you did save the best for last, the necklace is stunning and your own personal trophy for endurance and strength. Great job ! Absolutely stunning - a true labour of love....and so worth it. Thanks so much for organising this fantastic blog hop - I've really enjoyed it!! Lori, thank you so much for hosting the party even though you have been fighting the physical problems. Your soup was amazing. I loved everything but the last necklace was absolutely my favorite. I can't believe you did all the wire wrapping with your hands hurting the way they are I only hope someday my wrapping will be as lovely as yours. oh gosh are those ever so pretty!! I love the colors. PS I know I tend to lurk because I'm not always great with words but I just wanted to let you know that I have been thinking of you a lot and praying for you. I have known you since I first started with my business online. Gosh 10+ yrs now (OMG!! lol!) and you have always been the nicest, kindest and strongest person and such an inspiration to me. Thank you for all that you do! Amazingly gorgeous Lori! That necklace is fantastic, but so are your other pieces as well! And you did it all not feeling well! Good for you! I love Barb's work and you showed it off amazingly. Thank you so much for hosting even during all your health issues - you rock! All of your creations are gorgeous but your last one is over the top. I can see why that one goes into your jewelry box. All that wire wrapping! Amazing!! But you made one hell of a necklace!! Beautiful pieces from a great Calorie free Soup! OMG!!!! That necklace is absolutely incredible. Not only is it gorgeous but it is such a testament to your strength of will with all those tiny wraps. I am also in love with the bracelet with those interesting square beads. All of these designs are gorgeous!!! I adore the bracelet and the necklace! Thanks for the tip on the ear wires with headpins! Just beautiful. You do amazing work. You are truly an inspiration. Despite your pain you do amazing things. Thank you for hosting this blog hop. Thank you for being you. Amazing work, darling <3 You did so well ! And all the little wire loops on the last piece are making -my- hand hurts ! Congratulations on another successful soup party! Hard to sample all the bowls! Your necklace is stunning. I can't imagine doing all those wire wraps - and yours always so perfect. Hope this finds you feeling better - you are amazing! Oh my gosh, Lori, your pieces are so beautiful! I looooove your bracelet, the colors, the design, your great ideas putting it all together! And your necklace is so adorable. What an awful lot of work, all in just one day! Wow! That's the perfect design for those unique silver leaves. Your pics and the description of how you made the jewelry are amazing. Thank you so much for being our hostess, for organizing the Blog Hop, for everything! I wish you all the best, get healthy and keep on rockin'. All of your pieces are gorgeous. You put an amazing amount of time in them and it shows! 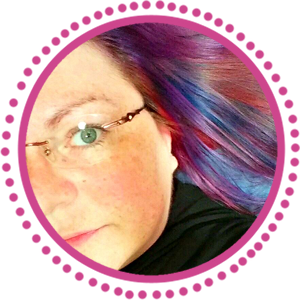 Thank you for making this blog hop possible. 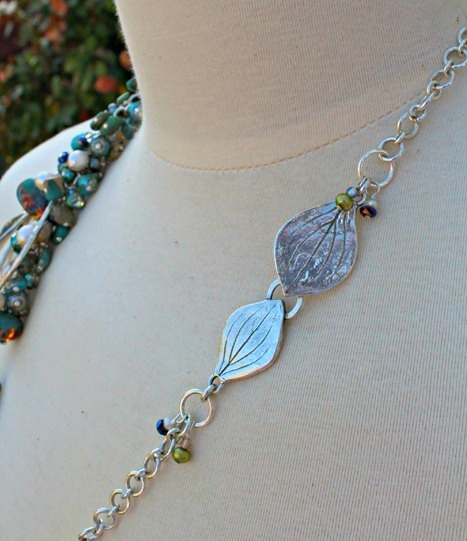 I am amazed at the lush color combinations in that necklace --SO beautiful! Beautiful work, every piece. Especially like the use of the flip flop bits. You are truly inspiring Lori, thank you for sticking through it and lovely pieces! I love everything you made, however my favorite piece is that silver wired necklace. I cannot imagine the time it took to do all that little wiring! I love your eye for details and the way the silver pearls add that extra pop of color. great pieces, especially the last necklace, congrats! Wow oh wow oh wow. I love that necklace! Lori ,this is my first BSBP and loved every minute.Now lets talk about your soup.I love the bracelet and that fabulous necklace a a million wraps .Wire wrapping is my favorite technique and could be wrapping wire all day.The blue beads on your bracelet are very pretty and have a rustic look.I HOPE everything goes well for you and keep your spirit up. Hey! My blog is http://labweorc.wordpress.com/ rather than fandangling!!! That's totally my fault! I love all the jewelry you created, Lori. Your last necklace is incredible!! WOW--so much work. That necklace will be in my third reveal favs post tomorrow. Thanks for the tip on ear wires--I'll use that one for sure. Thanks for all you do. Feel better. Thank you sooo much for the fabulous party. The soup was great and your guests are phenomenally talented!! Not that I'm surprised given your talent! I love your creations but that last necklace just takes my breath away!!! You are amazing!!!! That is some major work. My favorite is the bracelet. Those beads remind me of petroglyphs. Dear Lori, What a joy to read your post! and I'm lovin' the blue bracelet. Your necklace, is to die for. with a big group of BSBP friends! I admire your attitude and am taking it to heart. Wow Lori, what an incredible job you've made!! In your jewelry I see not even a shadow of pain, dark thoughts and insecurities! you just express life and hope and joy and beauty and love and everything that is good in this world and that's because the world is responding to your inner beauty and you express that in your work, like a mirror of the universe that loves you!! Be blessed! Lori, as ususal your pieces are wonderful and unique. This time what impress me the most is that you dedicate four hours of intense wire wrapping to make this gorgeous necklace. Specially being in pain and knowing you will be in pain afterwords, many people would have taken the easy road and create something simple. But this speaks about who you are and how you approach life. Keep going, you are and inspiration and a remarkable artist. Love all the pieces that you made Lori... such intricate pieces... can't say which one is my fav... but the ear rings are especially great... Thanks for the fab job in doing this fantastic Blog Party hop!! You are officially a superwoman. I'm convinced you have superhero DNA. There is no other way you could have made all those stunning, beautiful pieces while in debilitating pain :-). Seriously though, I love every piece you made, but my absolute favourite is the one that took the most time and effort - that fabulous dangle-filled necklace. You did a super job - with all your jewellery AND with putting this party together. Thank you so much! I'm already looking forward to next year's BSBP. OH YES!!! Lori that is a BEAUTIFUL Necklace! Love it! Clicked publish before finishing my comment! Thank you for this wonderful party Lori. It has done so much for me personally. Why didn't I discover BSBP before? In the 3 odd months I have been around the blogs and facebook group the confidence I have gained is priceless! I have learnt new things, created pieces completely out of my comfort zone and just had a fabulous time. It is something that is helping me develop as an artist and I really cannot thank you enough! 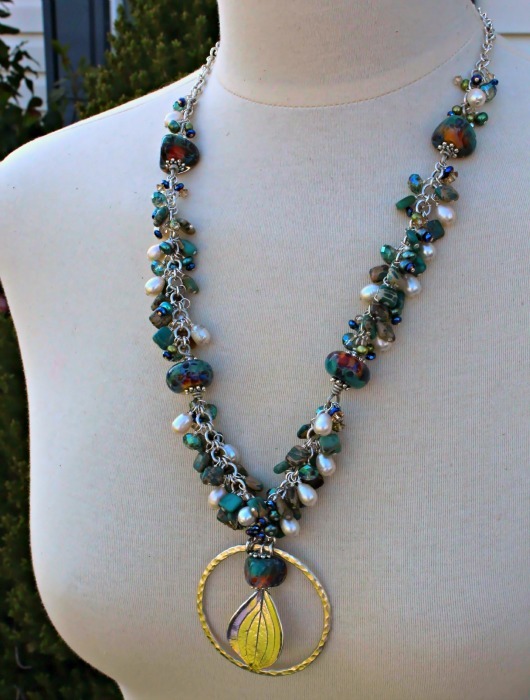 Fabulous Lori, all of those pieces are wonderful and the necklace is just a corker! I'm sure it's been worth it too, even if you're paying for it now! This has again been a wonderful BSBP, and I'm really looking forward to next year's party as well as the Bead Hoarders Blog Hop coming up! Lori, what a fantastic job. Especially considering all the pain and issues you've been dealing with. The little dangles made from flip flops are adorable. And I'm in awe of that final necklace. What a wonderful job. Congrats. I just started my hopping. Your pieces are all beautiful as usual. The necklace inspires me to try that technique. Lori - Absolutely drooling over that necklace! Wow! your designs are awsome as ever! I would wear every single piece. And thanks for organizing this hugh bead soup party. Lovely jewellery! They're all very nice, but that blue bracelet with the copper leaf chain must be my favourite. Fab job! And thanks for hosting this awesome party again! Lori, first of all many thanks for hosting these amazing event. Thank you for bringing all these wonderful designer together. I love the soup that you've done with your soup. Especially I love the green earrings and the bracelet. They are so beautiful! I like your jewelry very much, I like the Party very much. The blue bracelet is my favorite, and I must try the interesting method of making a fringed necklace. Thank you, Lori! Ohhh Lori' thanks again for the wonderful party! And your pieces are gorgeous as always! Looooooove the bracelet with the fringy- chain! I definitely love this bracelet most. My favourite colors and so different. Very creative. I think the ready-made bangles and the leafs make it so special! I love them all but my favourite is the tube bracelet, that is REALLY cool! how u managed to complete everything in time for the 3rd reveal is amaze-balls!! i especially like the purple and green earrings and the blue bracelet.. the last and most beautiful necklace is just so gorgeous and I can imagine the amount of time and work that went into its creation... wouldn't all the beads make it a heavy necklace though..?? thanks for hosting and a yet another successful BSBP! I am in AWE of your art and your courage. I'm so glad to have been a part of this bead swap. Thank you so much for hosting it, thus giving us a part in each other's lives. It was nice to see you again Lori for the third time for me. CongratulationsM. I love that necklace! Stunning colors and love the wiring and pmc works of Barb. I'm totally stocked too, Lori! :0) What a beautiful necklace! Love the colours in it, love the way you put the lampworkbeads in scene and accomplish the necklace with all those lovely beads from Barbara! So much work to wrap them all! The focal is an eye-catch too, the silver gives the necklace a really noble touch! Also love the bracelet - what should I say less than: oh WOW, very well done! Hugh thank you for hosting this fantastic event. This has been such an eye opening challenge and i have loved every minute. Your work is breathtaking, i love how you have worked your pieces, you have complimented each and every piece of your soup with a great talent for design. I can testify that having made loads of links with tiny tiger's eye, that it's a major pain - but so worth it. The effect you've achieved is rich in texture and light catching twinkles and best of all the movement it gives to the necklace is amazing. Elegant colour scheme too. Yep, the hostess with the mostest! Wow, Lori - what an astonishing amount of product. Very beautiful pieces. So many interesting beads and so much fun! Really nice pictures as well. What a lovely soup and such fabulous pieces you have created from them. The first pair of earrings and the bracelet are my favourites. 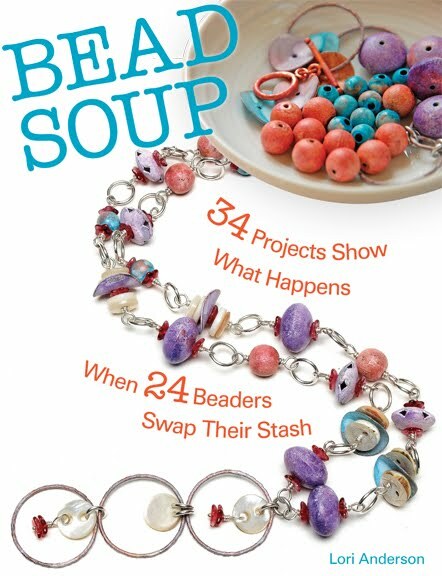 Thanks for putting the whole bead soup blog together - you did an amazing job! I always love your makes. Earthy, organic and so full of personality. A true artist. Beautiful! And so much work! I just love the earrings and the tip to wrap them both at the same time. Perfect! Thank you for all you do and enjoy your hop! WOW! Merja your jewelry is awesome. My favorite is the long necklace with the silver star focal. Wow!! All your pieces are just amazing! The blue bracelet is to die for...Really wonderful design. I'm amazed at all you have done...especially not feeling well. Thanks so much for all your hard work....it has been another incredible hop! Wow!!! I'm in awe of your talent and creativity, both in terms of your own designs and organizing/managing Bead Soup. Your necklace is amazing. The assemblage of color and texture is unique and attractive! I love what yous made with your soup!! It's all in the details - gorgeous!! I'm still bloghopping and today I'm here :-) I absolutely love the gorgeous pairs of earrings you made! And wow,the necklace and bracelet, those colors & designs are very very pretty! A lot of beautiful work in periods of not feeling well. You're a 'strong' woman! Again, I'm so sorry it's taken me so long to work my way over here. Like you, I'm still trying to hop to all the blogs on the list. And, I'm feeling just fine. . .albeit a little lazy maybe. Anyway. . . about your soup. I have to say that I'm not surprised because it is GORGEOUS like everything else you create. Those earrings are fun and elegant at the same time. The bracelet has so many neat elements I can hardly stand it. And that necklace. . .ohhhhhhhhh. I saw your picture of it without the dangles and thought it was beautiful like that, but then you worked your Lori-magic on it to make it phenomenal. I can't even express how awesome it is. I'm so glad you found the will and drive to get it made despite the pain. You're such a strong lady! Thanks for the tips on making the ear wires as well as how you assemble you dangle necklaces. I'll definitely be keeping those in mind.